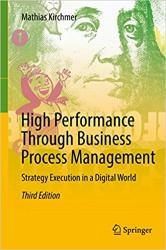 This management book presents value-driven business process management as a successful discipline to turn strategy into people- and technology-based execution, quickly and at minimal risk. It shows how to achieve high performance successfully in a digital business environment. Static business models do not keep pace with the dynamic changes in our digital world. Organizations need a management approach that fits this environment and capitalizes on its opportunities while minimizing the related risks. They need to execute their business strategy fast and reliably. In effect, they have to know how and when to modify or enhance their business processes, which processes are the best candidates for intervention, and how to move rapidly from strategy to execution. This means organizations need to establish business process management as a real management discipline. The importance of process innovation, digital technology and people aspects, process governance, internationalization, emerging processes and the unique situation in mid-market organizations are some of the key topics discussed in this book. It ends with a comprehensive case study and a discussion about what process engineers can learn from jazz musicians.